My Ikea Billy built-in bookshelves are finally primed, painted, caulked and styled! 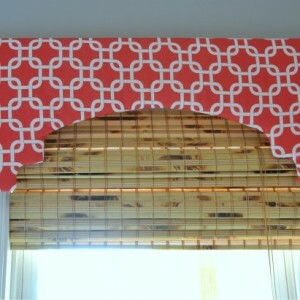 If you missed Part 1 of this project, be sure to check out my tips on how to pull off this Ikea hack. 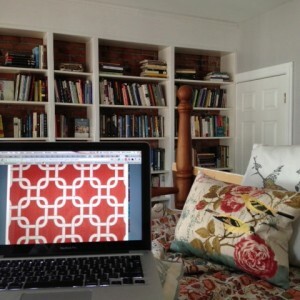 Today, I want to share with you how I styled the shelves. My husband has his PhD in Religious Studies and his favorite pastime is reading; therefore, we have a LOT of books. I thought for sure that we would have so many that styling wouldn’t be an option. Matt knows me well and didn’t want to rob me of the joy of styling, so he took a bookshelf full of books to his office and we have another bookshelf in the closet which freed up some space to make these guys look cute. Yay! Room Styling Tip 1: Start with your inspiration. When deciding how to style a room, you should always begin with your inspiration objects. We upgraded the bed in our master bedroom to a king (post coming soon), so I knew I wanted to reuse our bed and bedding in the guest room. I also knew that I wanted to keep this commissioned butterfly painting in the guest room. It was given to me as a wedding gift over 14 years ago by a dear friend. 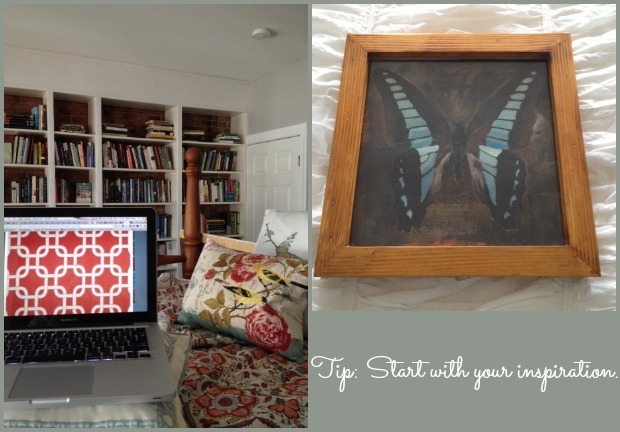 The butterfly was painted over mixed media (before doing so was trendy) and the frame was handmade. With my bird pillows and this artwork as my room inspiration, my color scheme was decided. Bookcase Styling Tip 2: Choose your objects in your color scheme and adjust the height of your shelves accordingly. 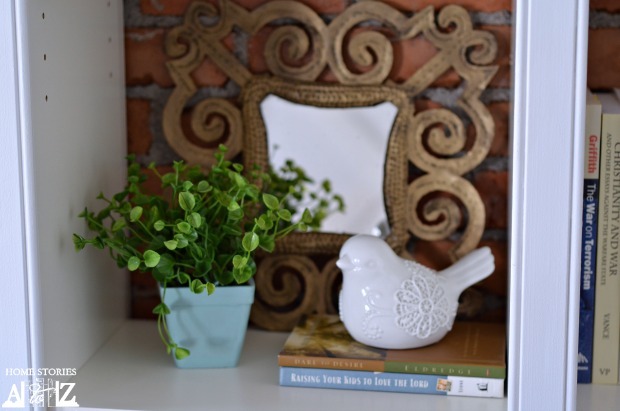 I shopped the house for objects that might work on the bookshelves and then I painted them or used Rub n’ Buff to make them fit my color scheme. Don’t be afraid to paint a mat, a flower pot, or an accessory so that it better fits in with your decor. I had all of the accessories below but the terracotta pot for the plant matched the brick and didn’t stand out. I used some acrylic craft paint to give it some color. The metal frame was tarnished silver before, so I transformed it with the help of Rub ‘N Buff in European Gold. 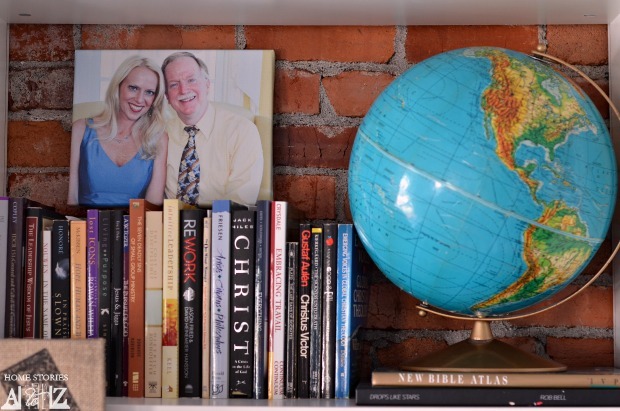 Bookcase Styling Tip 3: Layer meaningful objects above your books and place books at different angles. My father passed away a few years ago, and I love this picture of the two of us. 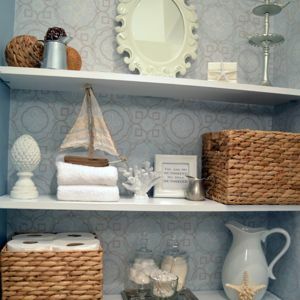 Use objects on your shelves which hold meaning for you and use dead space above the books for items of interest. I found the globe for a few bucks at the thrift store and love the color it adds to my shelves. I chose to place most of my books vertically on the bookcases, but I added some horizontal stacks for variety. Bookcase Styling Tip 4 & 5: Zig-zag your items back and forth on your shelves to create visual triangles and keep symmetry and scale in mind when placing objects. 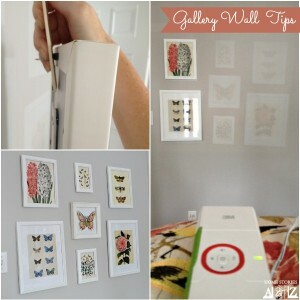 Hang art on the outside of your shelves. My shelves are not perfectly symmetrical but I kept symmetry in mind while styling. I also incorporated pops of color in visual triangles down my bookshelves. For more details on what I mean by “visual triangles”, I encourage you to read my post How to Decorate Shelves where I explain it in full. I found the hummingbird and butterfly art for $12 and knew they would look great in the room. I hung the art to the outside of the shelves using 3M command strips. So let’s review! 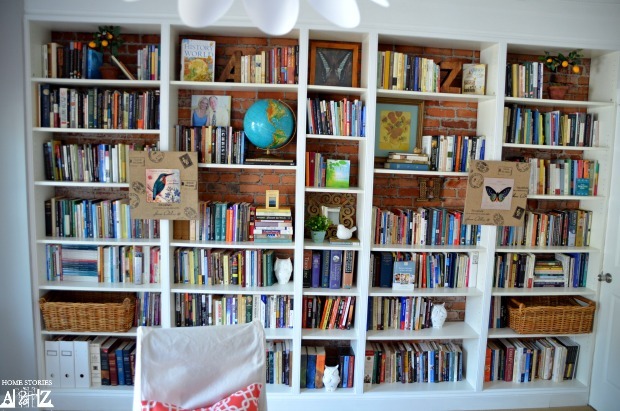 Here is what this room looked like with the old bookshelves and decor. Here is what it looked like “during” with the new built-in Ikea Billy bookshelves in place. And here is what it looks like now! 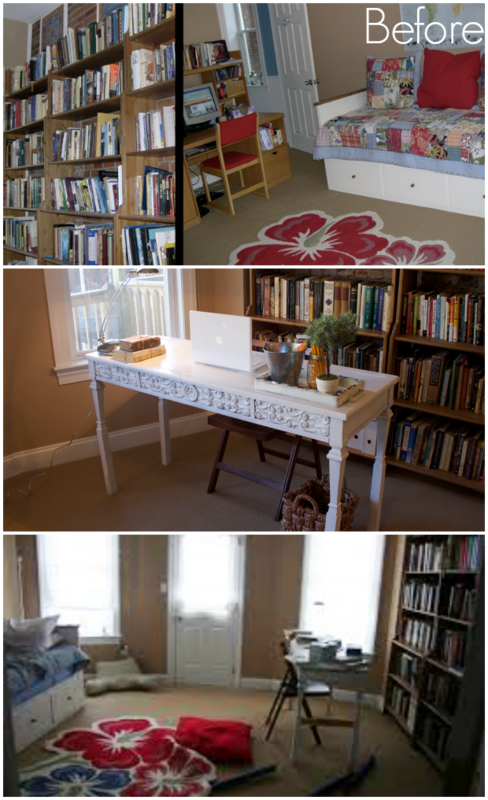 I am thrilled with how this room has turned out and will be sharing with you soon how I created the rug and desk. In the meantime, be sure to check out the related posts on this room below. Is the heating vent covered? I am also a book lover and am always looking at book storage ideas. Great project! Thanks! The heating vent is centered over the very center bookshelf and the vent was moved to ventilate up through that shelf. I styled the bookshelves for the post but that compartment is typically left blank for venting purposes. It probably would have been smarter to have moved the vent out when we built the base (rather than up) but we didn’t think about it well enough in advance of building our frame. Hi! These look beautiful. It’s been over a year now since you posted this, and I’m wondering how the shelves have held up under the weight of the books. 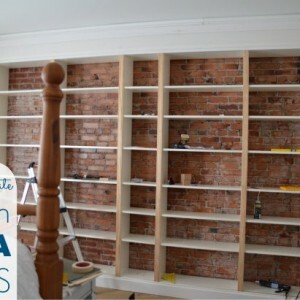 I am buying Billy bookcases today to create a fake built-in and am wondering whether I should be considering reinforcing the shelves, and if so, how I would go about that. They’ve held up great! No sagging at all yet and I was really worried that they would under all the weight. We haven’t had any problems at all. Wonderful! Thank you for the follow-up! This looks great! 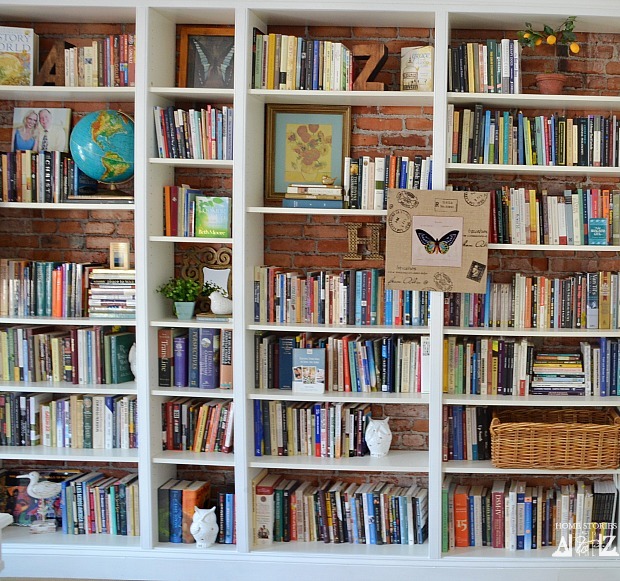 Love the contrast between the shelves and the back – by the way: is this a real brick wall or did you “fake” it? We’re thinking of doing exactly that and are wondering if you could share any experiences regarding wall paper / poster / ?? to get the brick effect? It all looks great and very cosy! I must add that this one is giving me ideas about what we can do with ours in the living room. 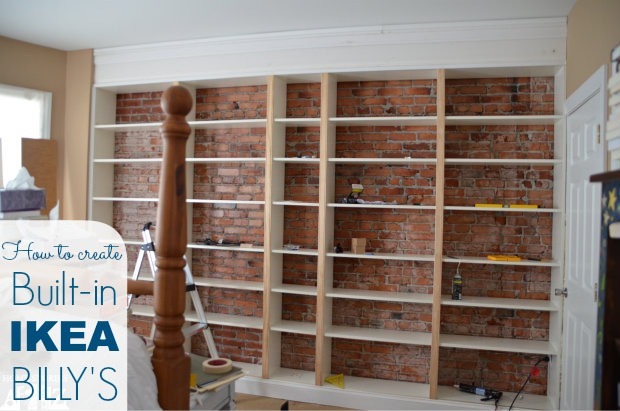 This is a fantastic project – I’m a sucker for the exposed brick! Great job! gorgeous!! so jealous of ALL that awesome storage!! I love seeing book shelves that actually have books on them!! 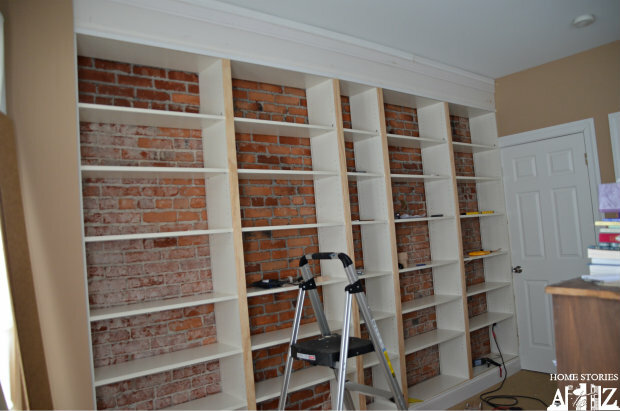 It is sad when bookshelves are full of just “stuff.” You did a great job and I love the brick wall behind! Thanks Kim! I actually don’t mind bookshelves filled with stuff. It has to be stored somewhere, and I love a well-styled bookshelf :). Thanks Maryann! Feel free to copy :). I love the idea of styling with books, in part because I love books, but how do you find the books you need if they are all shelved by color or size or some other characteristic? That’s always been a conundrum for me. 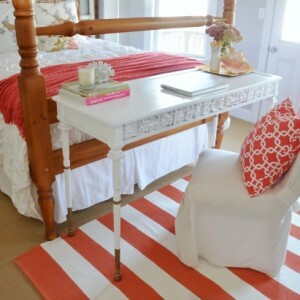 I think I may be in love with the red and white in the bedroom! I had Matt organize his books for me in sections and then I rearranged them by size and stacked them in a way that I liked. It wouldn’t work for us to have them in a color-coded fashion either. I’ve seen some bloggers make new jackets for all of their books so that the books are gorgeous and uniform. That definitely wouldn’t be something I’d want to take on unless I only owned 20 books, but if you have the patience it is a beautiful solution :). 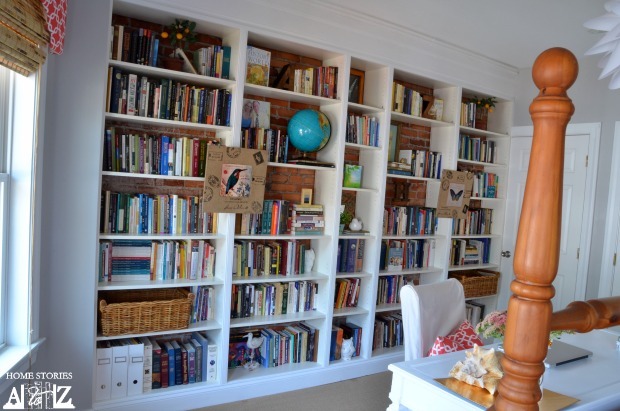 I love the contrast of the exposed brick and bookshelves with the rest of the room. Really pretty! Great styling tips. I think I restyle my bookcases more than anything else and as soon as something doesn’t fit my color scheme, out comes the spray paint! Thanks Kathy, and yay for paint! It helps transform everything on-the-cheap. Wow, what a difference! 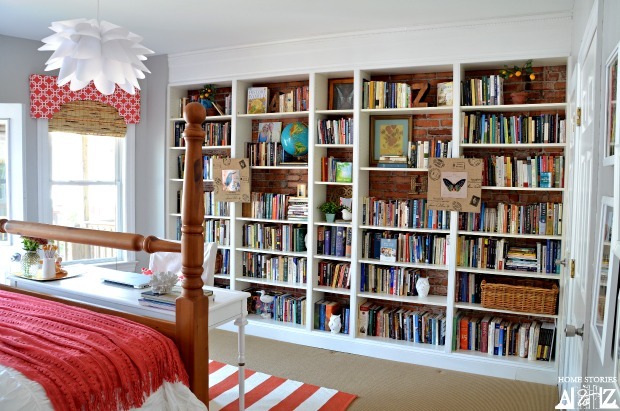 I love so many things about this room and the IKEA bookcase hack. I love that you kept the brick exposed in the back…the pops of color and vignette styling are beautiful…the hummingbird & butterfly hanging outside is perfect…the picture of you & your Dad is such a perfect touch…the pops of red in the room…and where you placed the white desk at the foot of the bed. I’m lov’n this room and your guests are lucky to have such a beautiful room to stay in. We have plans for built ins in the living room, with the bottom half closed off for storage. How do you feel Billy cases compare to other stock shelving, like say Walmart? We chose to go with the Billy’s because I wanted built-in bookcases up to the ceiling. Most bookshelves are around 7′ high and our ceilings are 9 feet. The Billys’ have an extender option which gave us another foot so we went for it :). I think the jury is out on the quality of the Ikea shelves compared with other inexpensive shelving options. I’ve heard that the Billy shelves sag over time under the weight of heavy books, so time will tell if we have that problem. For now, I love them! We’ve used Billy Bookshelves for years and ours have never started to sag…although we never detached the back, but I’m guessing that doesn’t matter, probably there for visual use anyway???? Love the look of them being built in!!! Thanks Stacy and good to hear! We did this awhile back and no sagging yet. Fingers crossed that it stays that way!